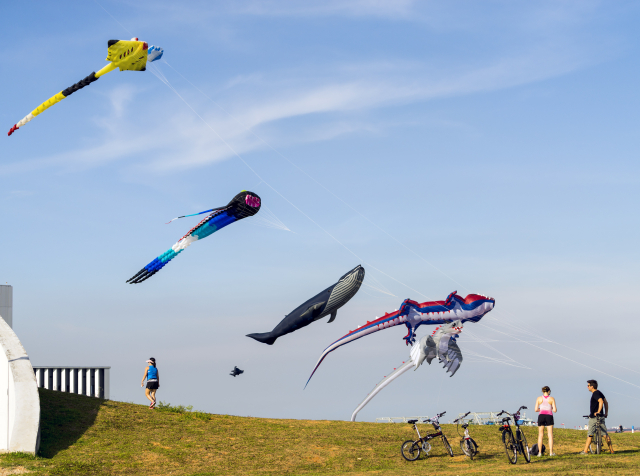 UNLOCK new experiences, family adventures, unique shopping finds, Singapore's best beach spots, a food paradise and explore a varied city basking in heritage and modernity. 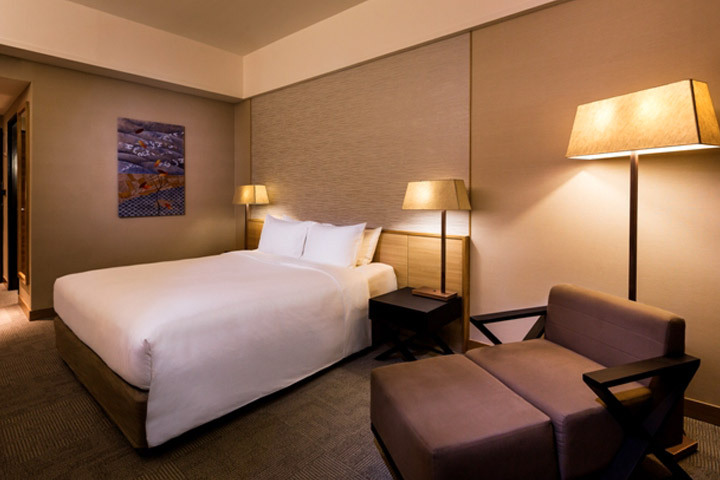 Furnished in homely natural tones, our spacious Superior Room is available in a standard king or twin bed configuration. It is ideal for adults or families. The Superior Room has a bathtub and equipped with self-controllable air-conditioning, iron and ironing board, safe deposit box, 32-inch wall mounted cable television and radio channels, complimentary wireless and fixed line broadband Internet access, mini-bar, complimentary coffee and tea making facilities, telephone with IDD service, voicemail, hairdryer, plush feather pillows and duvet and bathroom amenities. With contemporary furnishing in earthly hues, our 32sqm Deluxe Room offers a home-away-from home sanctuary for our guests. It is available in a standard king or twin bed configuration, ideal for adults or families. The Deluxe Room has a bathtub and equipped with self-controllable air-conditioning, iron and ironing board, safe deposit box, 32-inch wall mounted cable television and radio channels, complimentary wireless and fixed line broadband Internet access, mini-bar, complimentary coffee and tea making facilities, telephone with IDD service, voicemail, hairdryer, plush feather pillows, overmattress and duvet, bathroom amenities with bathrobe and slippers. 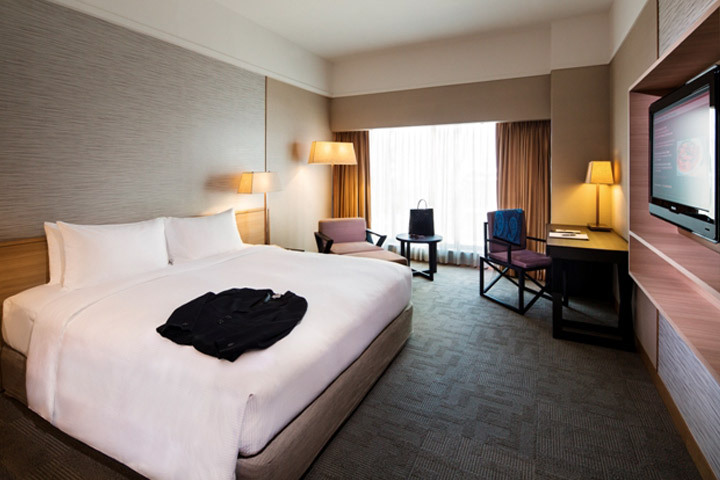 Exuding a modern and chic minimalist Zen flavour, our Executive Room is a popular choice with many business travellers as it is an ideal enclave for them to take care of business and other affairs. The Executive Room grants the guests Executive Lounge access. It has a bathtub and equipped with self-controllable air-conditioning, iron and ironing board, safe deposit box, 32-inch wall mounted cable television and radio channels, complimentary wireless and fixed line broadband Internet access, mini-bar, complimentary coffee and tea making facilities, telephone with IDD service, voicemail, hairdryer, plush feather pillows, overmattress and duvet, bathroom amenities with bathrobe and slippers. 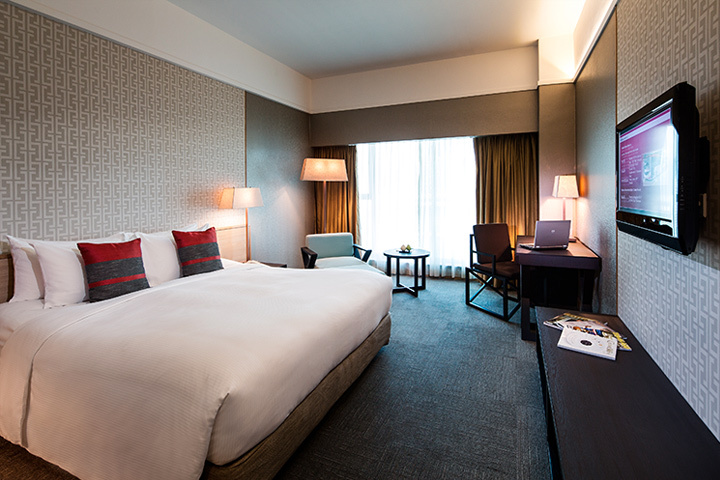 With a spacious 50sqm area and homely setting, Grand Mercure Singapore Roxy’s Junior Suite is perfect for a getaway away from the hustle and bustle of the city on the East Coast of Singapore. It is also a suitable choice for business travelers on medium to long business trips in Singapore with their partners or families. The Junior Suite has a living room and bedroom. It grants the guests Executive Lounge access. The Junior Suite has a bathtub and equipped with self-controllable air-conditioning, iron and ironing board, safe deposit box, 2 sets of 32-inch wall mounted cable television and radio channels, complimentary wireless and fixed line broadband Internet access, mini-bar, complimentary coffee and tea making facilities, telephone with IDD service, voicemail, hairdryer, plush feather pillows, overmattress and duvet, bathroom amenities with bathrobe and slippers. 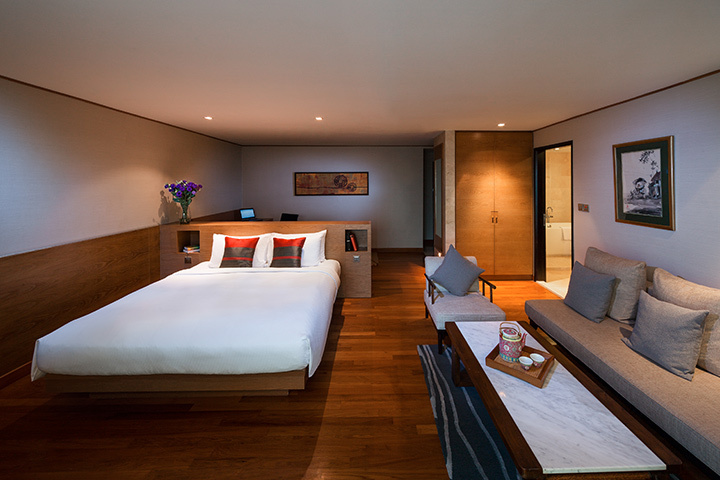 Decorated in earthly hues with a chic minimalist Zen flavour, our 52sqm Studio Suite exemplifies the perfect getaway for both business and leisure travelers looking for a sanctuary in a world away from the hustle and bustle of the city. The Studio Suite grants the guests Executive Lounge access. The Junior Suite has a bathtub and equipped with self-controllable air-conditioning, iron and ironing board, safe deposit box, 2 sets of 32-inch wall mounted cable television and radio channels, complimentary wireless and fixed line broadband Internet access, mini-bar, complimentary coffee and tea making facilities, telephone with IDD service, voicemail, hairdryer, plush feather pillows, overmattress and duvet, bathroom amenities with bathrobe and slippers. 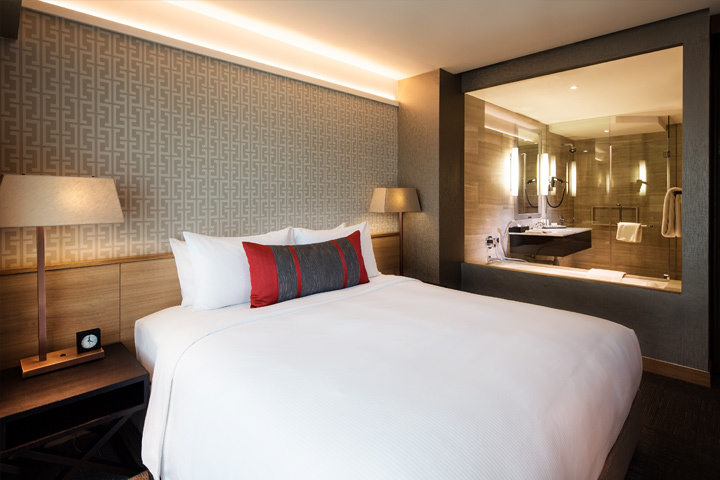 Exuding a modern and chic minimalist Zen flavour, our Business Suite is a popular choice with many business travellers as it is an ideal enclave for them to take care of business and other affairs. 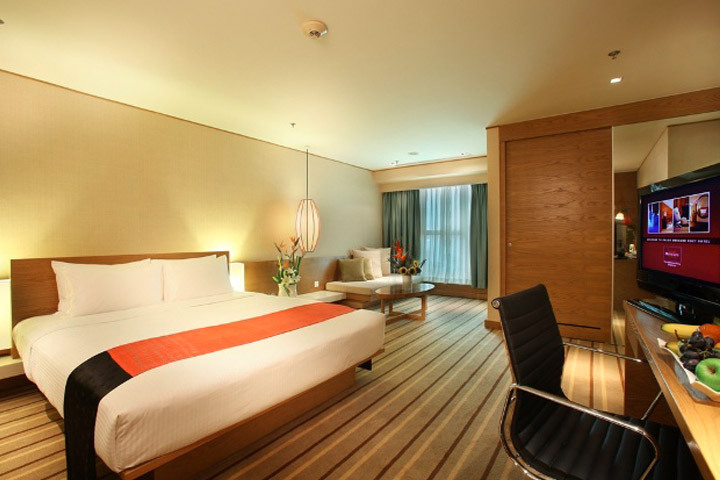 The 54sqm Business Suite is well equipped with the necessities to conduct business from. It has a writing desk with easy broadband access to the complimentary Internet and WiFi, telephone with IDD service for international business calls and a LCD flat screen TV with cable channels and radio channels to keep in touch with the latest news happening around the world.